Kaiserslautern sophomore Ronin Sherman slammed the door on SHAPE with the bases loaded in the last inning to preserve a 12-9 victory in the second game of a baseball doubleheader to complete a two game Friday weep. The Raiders won the first game 7-5. With the Raiders cruising in the second game behind strong hitting and solid fielding, SHAPE picked up five hits in its half of the third, the last inning because of the time limit. Kaiserslautern Coach Justin Bates wanted to save his ace, Sherman, for the doubleheader in Stuttgart the next day, but brought him in to get the last out with the bases full of SHAPE runners. Sherman got the final out to preserve the 12-9 final and the sweep. A Kaiserslautern hitter shows perfect batting form. Offensively, Sherman went two for two with a walk, a double, two runs batted in and three runs scored. Sam Newberry went two for three with two RBIs and George Stephan was one for one with a pair of walks. Justice Harper was the winning pitcher striking out three in two and two thirds innings pitched. In the first game, again it was solid defensive play and strong relief pitching that made the difference. Third baseman Harper had four assists, plus an unassisted double play with the bases loaded that set the tone for the afternoon. Harper snagged a line drive and stepped on third for the out to end the first inning. Kaiserslautern led 4-0 after the first. Sherman led off with a gap double and went to third on an error. A SHAPE error brought home the first run and Newberry ripped a double for the second run. Jace Robinson doubled off the wall in left to bring home two more for the 4-0 lead. But SHAPE tied it in its half of the second inning. By way of a couple hits and walks, it scored four runs and had runners at second and third when the Raiders brought in Tyler Otto to relieve starter Colin Zayd. He walked the first batter to load the bases, but recorded a swinging strike out to escape the inning. The Raiders put it away in the bottom of the inning with three more runs. The big blows were a single by Stephan that the left fielder misplayed, allowing a run to score, and a line drive by Matthias Perrin that brought in another. Newberry followed with single and it was 7-4. Stephan closed out the last inning on the mound. With runners on second and third and one out and one run in, he got a fly ball to left field, walked the next man to load the bases, then recorded the final out when the SHAPE batter popped up to first base. The final was 7-5. After a disappointing first weekend against Wiesbaden, Kaiserslautern Coach Justin Bates was relieved with the team’s improvement. 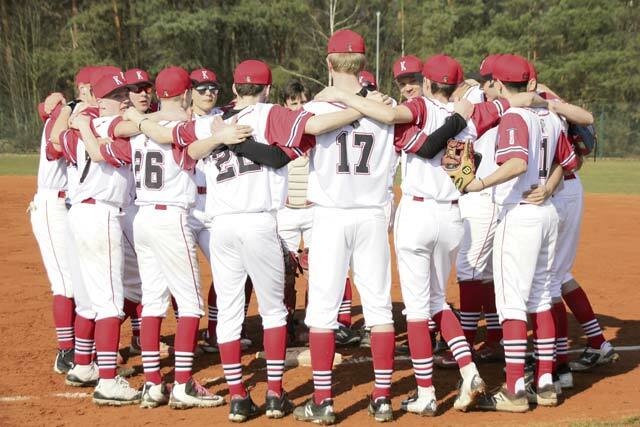 On Saturday, the Raiders bussed to Stuttgart for another double header. Sherman opened the game with a home run against ace pitcher Jack Harris and the Raiders followed with four hits and a walk. But Harris recorded two strike outs with the bases full to get out of the jam. Then in the home half of the first, a Stuttgart grand slam was the major blast and Stuttgart went on to a 12-3 victory. When four games are played in two days, the pitching staff takes a beating. It showed as the Raiders walked 14 batters in the first two innings, which is how long the first game lasted because of the time rule. In the second game, Sherman started on the mound and held Stuttgart close for three innings, but Stuttgart chipped away and picked up five runs in the fourth to take an 8-2 lead. 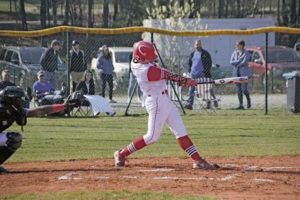 A Kaiserslautern rally brought them to within a run and the game ended with the Raiders making the last out with the tying run on second base. The final score was 8-7. Though they came out on the wrong side in both games, a few breaks could have made the difference. Kaiserslautern returns to action on April 19 and 20 with a round robin tournament along with Ramstein, Alconbury and Lakenheath.